The GIGABYTE X470 Aorus Gaming 7 Wi-Fi has a pretty stacked PCB with a host of onboard controllers and liberal aesthetical choices which don’t just look good, but also has plenty of use too. 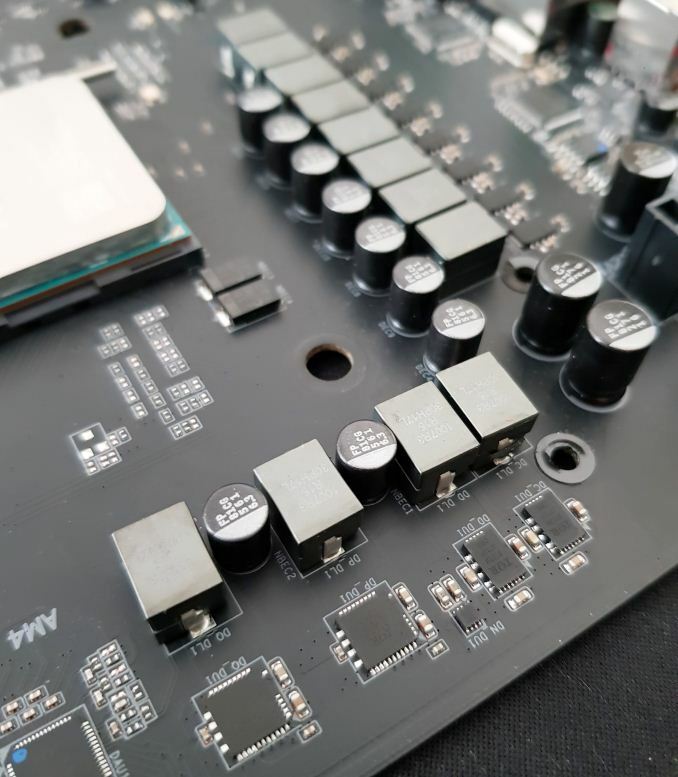 The most notable visual element to the Gaming 7 is a large copper direct pipe cooling-based heat sink with a stack of aluminum fins cooling the power delivery. This is a massive improvement on the solution used on the previous range of X370 boards from GIGABYTE and should go a long way. The PCB is black while the heat sinks have a gunmetal grey and black contrasting covering. The accent LED strip featured on the right-hand side of the board by the 24-pin ATX power connector can be replaced, although you will need a 3D printer to do this and the maker files themselves can be downloaded here. 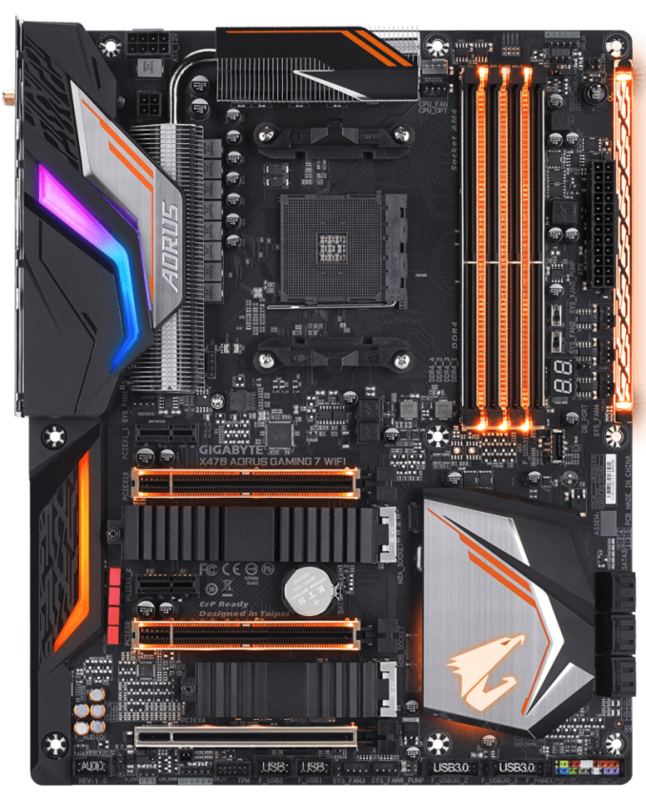 There is a clear statement of intent that GIGABYTE has equipped this board for users demanding premium components. The inclusion of a Realtek ALC1220-VB audio codec (which GIGABYTE claims to improve 3.5mm microphone input quality) along with the enhancement of the front panel input, as well as a complimenting ESS Technology SABRE ES9018Q2C 32-bit 8-channel audio DAC further enhances the overall audio quality on offer. The audio area features a wave of Nichicon gold audio capacitors and a single precision audio stream TXC oscillator chip. 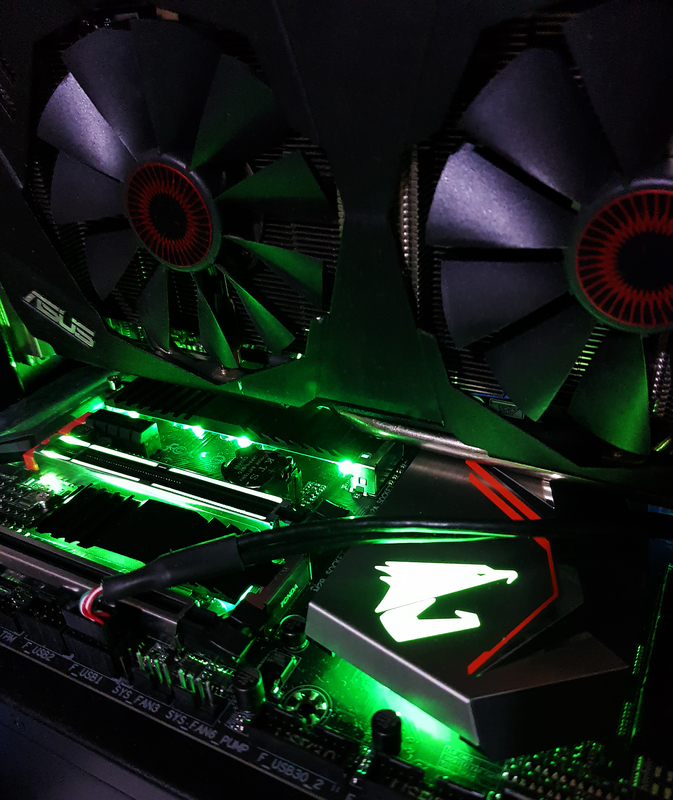 The X470 Gaming 7 Wi-Fi includes improvements in stylings over previous X370 models including a wave of RGB lighting featured across the board, as well as room for additional LED strips thanks to a two RGBW LED strip headers. A further pair of LED strip headers is also present as well as power select jumpers depending on the type of LED strip being used. With the Aorus RGB Fusion software, users can customize multiple zones across the board including the rear panel cover, the RAM slots, the two full-length PCIe x16 slots and even the Aorus logo on the chipset heat sink. On the rear of the X470 Gaming 7 Wi-Fi, GIGABYTE has included a backplate which covers the rear end of the rear panel and power delivery heat sink area. While there is no actual thermal benefit to this, the plate simply acts as extra reinforcement and for classier visuals. The power delivery features a 10+2 phase design with ten International Rectifier IR3553 40A drivers dedicated to the CPU with a further two IR3556 60A drivers dedicated to the SoC; an IR3599 doubler is present to enable frequency switching which halves the load placed on the individual drivers thus increasing longevity. Controlling the power delivery is a single IR35201 multi-phase controller which is only capable of operating a total of eight phases, which is why a doubler is necessary on this particular board. It’s an apparent trade-off in providing a more competent and cost-effective power delivery, especially on a flagship model if overclocking is a priority when it comes to making a purchasing decision. While the power delivery is one of the better power deliveries I have seen so far on an AM4 socketed motherboard, it’s further enhanced by a ‘better’ than average cooling heat sink consisting of a direct copper heat pipe with a large array of aluminum fins which was an essential must for a board wanting to push their components to the limit, as well as appeal to the wider audience of enthusiasts. The storage options on offer include six SATA 6 Gbps and a pairing of PCIe x4 (top PCIe 3.0 x4 and bottom slot PCIe 2.0 x4) M.2 slots. 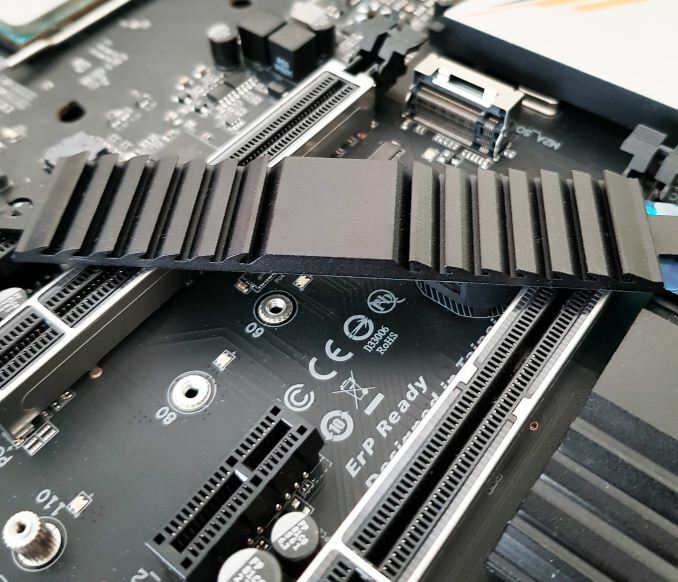 The top M.2 slot is located just below the primary PCIe 3.0 x16 slot with support for drives up to a maximum of 22110 (22 mm x 110 mm) in size, while the second slot is prohibited to drives of 2280 (22 mm x 80 mm). Both of these slots feature Aorus M.2 Thermal Guard which is a thin M.2 sized sheet of metal with ridged edging designed to catch passive air from cooling; they both also feature thermal pads to aid with heat dissipation. 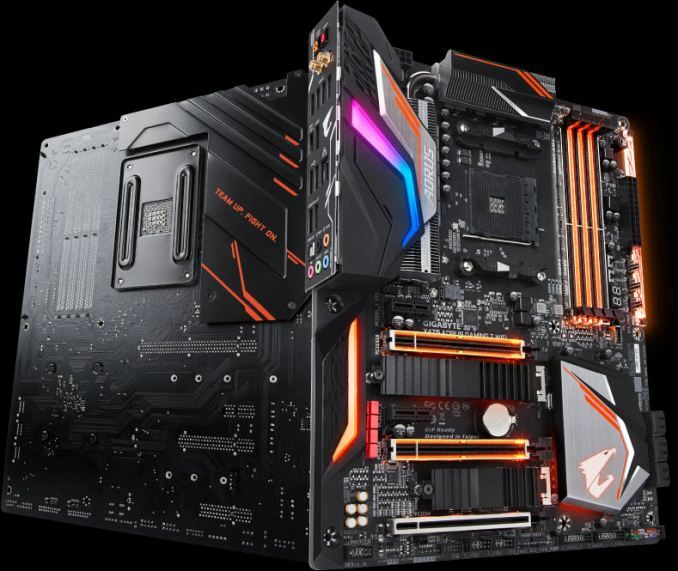 The previous X370 board at the top of GIGABYTE/Aorus X370 range, the AX370 Gaming K7, did feature a single U.2 port, but for some reason, the X470 Gaming 7 Wi-Fi hasn’t received the same treatment. It’s apparent that GIGABYTE has implemented dual PCIe 3.0 x4 M.2 slots capable of supporting the fastest of M.2 drives in RAID in favor of the costlier U.2 route; the U.2 drives dwarf M.2 in terms of $/GB and it’s one of the reasons M.2 is the more widely accepted and used choice over U.2 because of this. The GIGABYTE X470 Aorus Gaming 7 Wi-Fi hosts a total of four memory slots that allows for a maximum of 64 GB in capacity across four RAM slots with memory of speeds up to DDR4-3600 supported out of the box; the memory operates in dual channel mode. Like with the PCIe slots, the memory features metal reinforcement with integrated RGB LEDs for a more vibrant appearance when configured. ECC DDR4 unbuffered memory is also officially supported on this board. Right next to the memory slots is a Debug LED with a pairing of switches. Directly situated next to the LED debugger is a BIOS switch as the X470 Gaming 7 Wi-Fi features dual BIOS; a main BIOS chip and secondary chip used as a backup. The second switch allows users to select between single BIOS mode and dual BIOS mode. 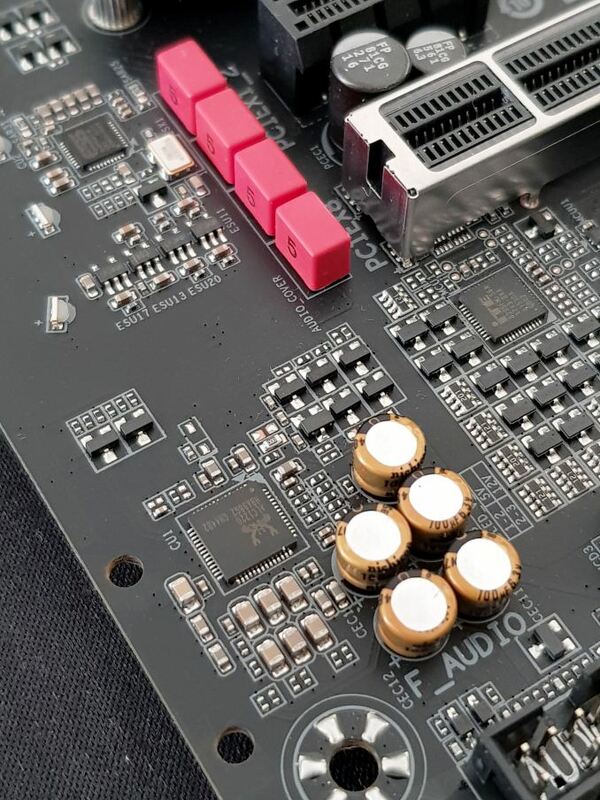 The GIGABYTE X470 Gaming 7 Wi-Fi does have a lot of bells and whistles, but it also features plenty of sustenance in connectivity, especially in regards to USB. The rear panel plays host to a total of ten USB ports in total with the fastest available coming two USB 3.1 10 Gbps ports; a single USB 3.1 10 Gbps Type-A is present alongside a single USB 3.1 10 Gbps Type-C this is due to an ASMedia ASM1143 controller. An additional six USB 3.1 5 Gbps Type-A ports and two USB 2.0 ports make up the remaining ports on the back, although an additional four USB 3.1 5 Gbps and four USB 2.0 can be made available thanks to internal headers. The X470 Gaming 7 Wi-Fi isn’t targeted towards users looking to build around one of the Ryzen APUs as no VGA outputs are present. The five 3.5mm and optical S/PDIF output for the onboard audio is powered by a Realtek ALC1220-VB codec, with a single ESS SABRE 9018 DAC, and a quintuple of gold Nichicon audio capacitors. There is no visible PCB separation and the ALC1220-VB codec has no specific isolation or shielding present which is a little disappointing as a board regarded to be one of the top offerings on a new chipset from a vendor would most likely feature at least one of the aforementioned aspects. Finishing off the rear panel is a power/reset button, a clear CMOS button, two antenna ports for the built-in 2T2R Intel 9260NGW 802.11ac Wi-Fi Wave 2 module and a single Intel I-211AT controlled Gigabit LAN port. 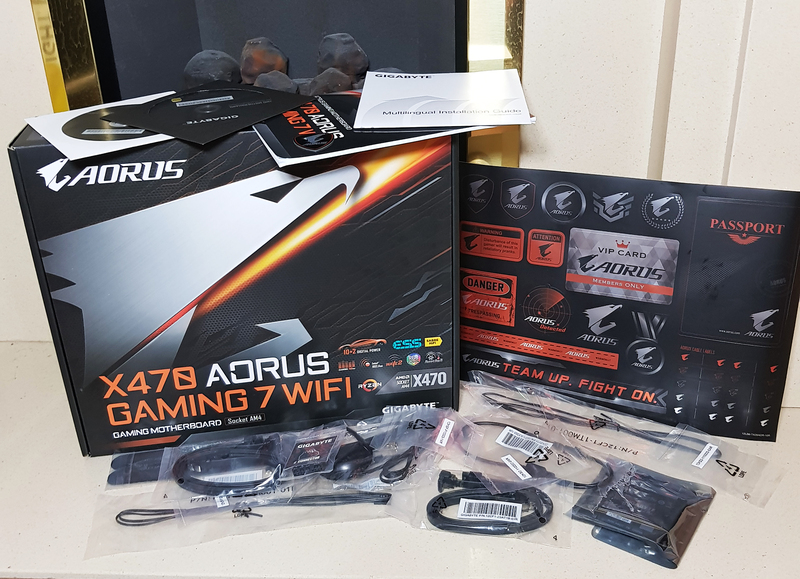 Everything required to get the X470 Gaming 7 Wi-Fi going is inside the box, including four SATA cables and a single RGB (RGBW) LED strip extension; great for installing an RGB strip in a large case or in a hard to reach areas. Also notable is a 2-way SLI bridge for multi NVIDIA pixel rendering cataclysmal gaming machines and two M.2 screws, as well as stand-offs to make use of the dual NVME PCIe 3.0 x4 M.2 slots. Wanted to upgrade to Ryzen 2 on an ITX board with a 4xx chipset for "proper" precision boost support - but am still waiting on availability of the damn things. I've had my Asus X470 ITX board since the end of May or so?